Airson seaghan eile, faic Uranus (soilleireachadh). Is Ùranas no Urànus (o Οὐρανός Sheann-Ghreugais tro Uranus Laideann) an t-seachdamh planaid on ghrian. Tha an treas rèideas planaideach as motha agus an ceathramh tomad planaideach as motha aige san rian-grèine againn. Tha stuthan Ùranais coltach ri stuthan Neaptuin, ach tha na stuthan ceimigeach aca diofraichte on fheadhainn aig na famhairean gasa nas motha, siud am Bliogh agus Satarn. 'S ann air an adhbhar seo gun cuir na h-eòlaichean "fuamhairean deighe" air Ùranas agus Neaptun gus an diofar eatorra is na fuamhairean gas a nochdadh. Tha àile Ùranais coltach ri feadhainn a' Bhliogh agus Satairn on a tha a' mhòrchuid dhe 'na hàidhdreaidean is hilium ach tha barrachd "deighean" aige mar uisge, amòinia agus methan cho math ri lorgan hàidhdrea-charbonan eile. 'S e an t-àile planaideach as fhuaire sa rian-ghrèine a th' ann agus is 49 K (−224.2 °C) an teothachd as lugh agus tha breathan neòil iom-fhillte aige. Thathar dhen bheachd gu bheil an t-uisge pailt sna neòil as ìsle agus methan sna neòil as àirde. Tha a' mhòrchuid dhe mheadhan Ùranais 'na dheighean is clach. Chan fhaicear Ùranas leis an t-siùil lom ach gu fann. Chaidh a lorg le William Herschel. 'S e planaid uaine/glas a tha ann. ↑ Simon, J.L., Bretagnon, P.; Chapront, J.; Chapront-Touzé, M.; Francou, G.; Laskar, J. (Gearran 1994): “Numerical expressions for precession formulae and mean elements for the Moon and planets,” ann an: Astronomy and Astrophysics , leabhar 282, àir. 2, td. 663–683. Bibcode: 1994A&A...282..663S. ↑ 2.0 2.1 2.2 Munsell, Kirk (14mh dhen Chèitean 2007): “NASA: Solar System Exploration: Planets: Uranus: Facts & Figures”. NASA. Air a thogail 13mh dhen Lùnasdal 2007. ↑ Seligman, Courtney: “Rotation Period and Day Length”. Air a thogail 8mh dhen Dùbhlachd 2009. ↑ 5.0 5.1 5.2 5.3 5.4 5.5 5.6 Seidelmann, P. Kenneth, Archinal, Brent A.; A'Hearn, Michael F.; Conrad, Albert R.; Consolmagno, Guy J.; Hestroffer, Daniel; Hilton, James L.; Krasinsky, Georgij A.; Neumann, Gregory A.; Oberst, Jürgen; Stooke, Philip J.; Tedesco, Edward F.; Tholen, David J.; Thomas, Peter C.; Williams, Iwan P. (2007): “Report of the IAU/IAG Working Group on cartographic coordinates and rotational elements: 2006,” ann an: Celestial Mechanics and Dynamical Astronomy , leabhar 98, àir. 3, td. 155–180. Bibcode: 2007CeMDA..98..155S. doi:10.1007/s10569-007-9072-y. 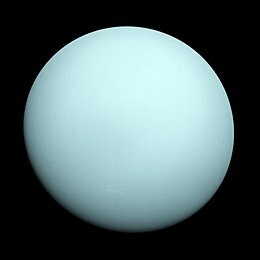 ↑ 6.0 6.1 6.2 6.3 6.4 6.5 6.6 6.7 6.8 6.9 Williams, Dr. David R. (31mh dhen Fhaoilleach 2005): “Uranus Fact Sheet”. NASA. Air a thogail 10mh dhen Lùnasdal 2007. ↑ Jacobson, R. A., Campbell, J. K.; Taylor, A. H.; Synnott, S. P. (Ògmhios 1992): “The masses of Uranus and its major satellites from Voyager tracking data and earth-based Uranian satellite data,” ann an: The Astronomical Journal , leabhar 103, àir. 6, td. 2068–2078. Bibcode: 1992AJ....103.2068J. doi:10.1086/116211. ↑ Espenak, Fred (2005): “Twelve Year Planetary Ephemeris: 1995–2006”. NASA. Air a thasglannadh [o http://sunearth.gsfc.nasa.gov/eclipse/TYPE/TYPE.html] 26mh dhen Ògmhios 2007. Air a thogail 14mh dhen Ògmhios 2007. ↑ 9.0 9.1 Podolak, M., Weizman, A.; Marley, M. (Dùblachd 1995): “Comparative models of Uranus and Neptune,” ann an: Planetary and Space Science , leabhar 43, àir. 12, td. 1517–1522. Bibcode: 1995P&SS...43.1517P. doi:10.1016/0032-0633(95)00061-5. ↑ 10.0 10.1 10.2 10.3 Lunine, Jonathan I. (Sultain 1993): “The Atmospheres of Uranus and Neptune,” ann an: Annual Review of Astronomy and Astrophysics , leabhar 31, td. 217–263. Bibcode: 1993ARA&A..31..217L. doi:10.1146/annurev.aa.31.090193.001245. ↑ Lindal, G. F., Lyons, J. R.; Sweetnam, D. N.; Eshleman, V. R.; Hinson, D. P.; Tyler, G. L. (30mh dhen Dùbhlachd 1987): “The Atmosphere of Uranus: Results of Radio Occultation Measurements with Voyager 2,” ann an: American Geophysical Union (Foills. ): Journal of Geophysical Research , leabhar 92, àir. A13, td. 14,987–15,001. ISSN 0148-0227. Bibcode: 1987JGR....9214987L. doi:10.1029/JA092iA13p14987. ↑ Conrath, B., Gautier, D.; Hanel, R.; Lindal, G.; Marten, A. (1987): “The Helium Abundance of Uranus from Voyager Measurements,” ann an: Journal of Geophysical Research , leabhar 92, àir. A13, td. 15003–15010. Bibcode: 1987JGR....9215003C. doi:10.1029/JA092iA13p15003. Faic cuideachd nithean reul-eòlasach agus liosta nan nithean ann an Crios-Grèine a-rèir rèideis no tomaid. Chan e planaid a th' anns A' Ghealach ach saideal ann an reul-eòlas seach anns an t-siostam Ptolemy. Air a tharraing à "https://gd.wikipedia.org/w/index.php?title=Ùranas_(planaid)&oldid=516530"
Chaidh an duilleag seo a dheasachadh 30 dhen Chèitean 2016 aig 15:52 turas mu dheireadh.